In How to Start Seeds, Part 1, I talked about some of the basics. I haven't figured out what to say for Part 2, but in the meantime I'll show you what we're doing. We used a couple of different techniques. The easiest is to put peat cubes filled with seed starting mix or potting mix into a waterproof container. Better yet, skip the peat cubes. 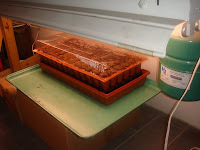 Then set it under fluorescent lights, apply heat and cover with plastic until the seeds germinate. Then keep them watered. 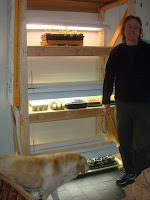 We also used Burpee's Deluxe Seed Starting Kit. It's not a bad product, though the only advantage seems to be that it is a mini SIP in design, allowing you to go a week without watering. Here's a schematic of the Burpee kit. 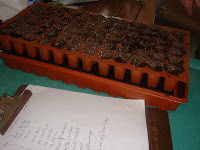 Starting 72 different seedlings at a time, it's important to keep a list of what you planted. 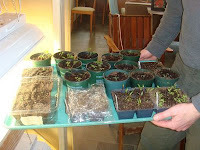 This year we're starting three times as many seedlings as we did before, roughly 300. That meant it was time to update our lighting rack. I used this design as a basic guide and made a few changes. I put two shop lights side by side on each level and omitted the hardwood dowel as a light support. You can read more about growing under lights here. 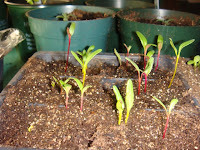 Once the seedlings have their second set of true leaves, they're ready to be transplanted into larger containers. I made 15 gallons of potting mix; 45% sphagnum peat moss, 45% coir, and 10% perlite. To this I added 3 cups of Espoma Plant-tone 5-3-3 and 3 cups of Nance Klehm's earthworm castings. 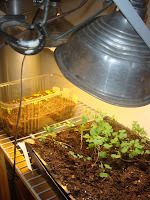 To protect the roots I use a kitchen fork to lift the tiny seedlings out of the germinating tray and drop them into a larger cup. Then I lightly pack extra mix around the seedling until it's set. Water them in and you're done. Art and Heidi had a few leftover cafeteria food trays that are perfect for this. 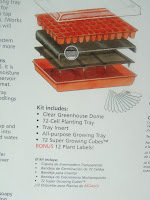 I can set 25 4" grower pots on each tray and then fill up the tray with water. Makes things much easier. 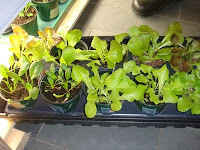 At right are Carmona Lettuce and Bloomsdale spinach. Here are some cold weather greens that will go outside around April 1st. This picture was taken March 22nd, it's amazing how much bigger they've gotten in the last week. Both Russ and Heidi have picked up most of their cold weather starts. I know Heidi's already got them planted in bucket SIPs in her new greenhouse; nice thing to have this time of year. 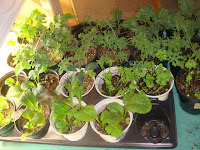 With those seedlings out the door I now have room under the lights to transplant our tomatoes, eggplant, peppers and herbs into larger containers. I got a great price on 500 32 oz. deli containers from a local vegetable market. With drainage holes drilled in the bottom they're perfect for seedlings. If you want us to start any seeds for you just let me know in an email (greenroofgrowers [at] geemail [dot] com) or comment. I'm not doing it for the money, trust me. I'd like to meet some of you and bridge the gap between the pixels on my screen and the real world.